To recap what we already know: You'll be able to buy a G4 next month with three different rear finishes: the leather we've all seen, a white (ceramic-coated) back and a hammered, "Metallic Craft" look that's actually just textured plastic. Pick up a G4 with that latter, plastic back and it'll feel instantly familiar, like a very slightly curved G3 (for extra durability, natch), or a flattened-out G Flex2. Trust me, though: If you're in the market for one of these things, you're going to want one clad in LG's vegetable-tanned leather. The company's event invitation showed off its fashionista ambitions to anyone interested, but it's even more handsome in person. We spent most of our time pawing a G4 with a deep caramel-colored leather back -- it was sturdy and unyielding, with less springiness than the leather you'll find on the back of the 2014 Moto X. To hear LG's brass tell the tale, it takes a full three months to convert a cow's skin into a cover for your phone, and some fetching stitching with Gütermann thread acts as icing on the cake. There'll be four colors at launch -- beige, black, sky blue and yellow -- and LG plans to have more on the market in time to match your jaunty summer outfits. Frankly, they can't come soon enough. While the bog-standard G4 feels purely all right, the tester units clad in leather felt absolutely phenomenal, not to mention a little thinner than their cousins. I know that's ridiculous. At 76mm wide, and with its 5.5-inch "Quantum" quad HD display -- more on that later -- the G4 will completely fill all but the meatiest of palms. 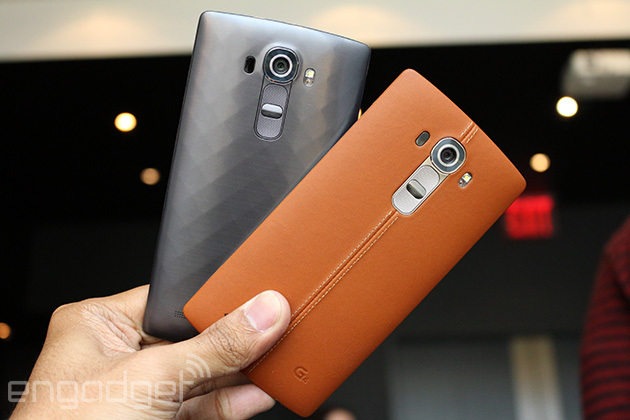 Still, the G4's gently sloping back settles much more comfortably into your hand when it's decked out in cowhide. Now, about that screen. LG's channeling the world of arcane science with its Quantum IPS screen, a 4K panel that plays nice with the film industry's DCI color standard. To date you've had to shell out thousands of dollars for DCI-compliant reference monitors (if you're in broadcasting, anyway), but LG was eager to bring that sort of accuracy to our pockets. The "quantum" angle is almost prohibitively complex, but no worries -- it means the screen has very accurate red, blue and green light sources all the while looking better outside and sipping more conservatively on power. So how does it actually look? At first glance, it wasn't immediately or necessarily better, just... different. Seeing an image of fresh, ripe strawberries on a G4 and a Galaxy S6 was perhaps the most telling example -- they looked purely red on LG's display, instead of the slightly out-there orange cast they took on thanks to the S6's super-saturated AMOLED screen. Alas, we reporters were stuck in a not terribly well-lit meeting room with these things, so stay tuned for more impressions to come. I've given LG plenty of props in the past for reining in its once-overwrought interface and shaping it into something more reasonable, but after spending plenty of time using Samsung's Galaxy S6, I find myself wishing LG had used an even lighter touch this time around. Even with that said, there's not a whole lot to dwell on here: The version of Android 5.0 Lollipop baked into the G4 is awfully similar to the one I encountered on the Flex2, save for just a few small touches. Remember how you could close your hand in front of the front-facing camera to trigger a selfie? Well, now if you clench your fist twice, the camera will snap four selfies in quick succession to make sure at least one of them looks good. LG has also cozied up to Google more here than it has before, replacing its stock browser with Chrome, preloading Google Office and giving G4 owners 100GB of Google Drive space free for two years. The end result is a bright, light, Material Design-y version of Android to dig into, but one that can still feel a little clumsy. Still, the hexa-core Snapdragon 808 and 3GB of RAM thrumming inside the G4 did a fine job keeping things running smoothly, and app launches and operation were as fast -- if not a little faster in some cases -- than Samsung's own flagships. Sadly, we didn't get a great handle on some of the G4's most notable features. Take the camera, for instance -- LG built it from the ground up with a 16-megapixel sensor and an f/1.8 lens around the back, which the company gleefully calls the brightest available in a smartphone. Throw in faster laser autofocus, RAW support and a color spectrum sensor that helps Auto mode scan and adjust to the colors and lighting of your subject and you've got a pretty powerful pocket camera. Too bad the inside of our meeting room didn't offer many vistas to shoot; what photos I did snap were crisp and well-exposed, but keep an eye out for some more nuanced impressions when we get our review unit. LG teamed up with Qualcomm to dramatically boost positioning performance, too, and they claim the system is twice as accurate as phones using a more "conventional platform." That's all thanks to how the G4 leans on the gyrometer and other built-in sensors for extra locational context. It sure sounds good, and Google Maps locked onto the hotel we were in quickly, but we'll see how well this really works soon. 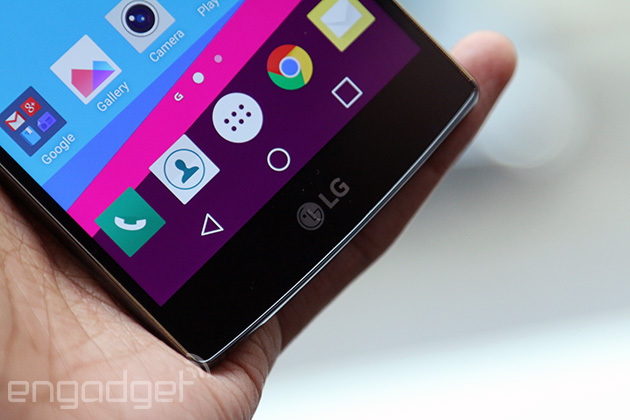 I'm also not entirely sure why LG gave up on Qualcomm's QuickCharge tech after I fell in love with it in the G Flex2. Sure, the G4 has a removable 3,000mAh battery, but I'd still love to juice the thing up in a jiffy, wouldn't you? Whew, okay. LG's done well in crafting a very handsome flagship smartphone that smartly addresses the shortcomings of its direct predecessors, and I suspect a decent chunk of people will take a shine to this thing. Still, I can't shake the feeling that LG might have played it a little safe this time. The camera improvements were a logical next step; just like the chipset choice was; just like the Flex2-y design was (leather experiments notwithstanding). All told, the G4 is a lovely device -- just not an immediately thrilling one. Maybe, like the leather stuck on the thing's back, this phone will only get better with time. Stay tuned for our full review to find out.